Miss Blush blue floral embroidered applique plunge v front full skirt formal dress. A very soft and feminine dress that’s perfect for any formal occasion and would make a gorgeous bridesmaids choice. Features pretty floral embroidery appliques on the bodice, sheer straps and cascades down the full skirt. The bodice has a plunge v front with mesh modesty panel and bust cups. The back is very low v with concealed zip. 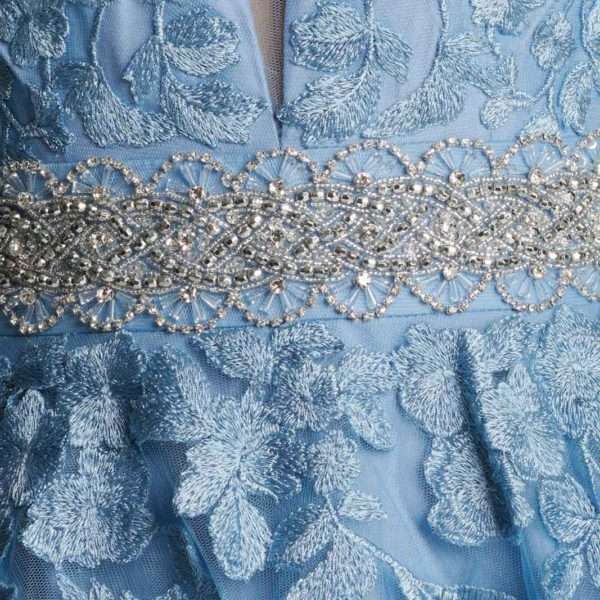 The dress overlay is chiffon like sheer fabric giving its its soft floating quality with matching blue underlining. 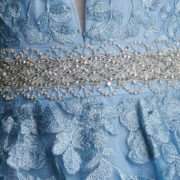 The waist band is a pretty beaded sequin, crystal and diamante feature in sliver and accentuates the waist of the dress.